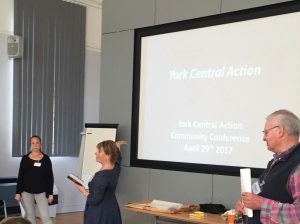 For many months York Central Action (YCA) has been pressing for more detailed information to be made public about the preparations for the development of the York Central site. Despite making some promising noises about openness, the York Central Partnership has shared little of significance with a consequent loss of public confidence in the way the project is being managed. The public consultation over the access road run by the Partnership brought this loss of confidence to a new low. Members of the public were frustrated by the materials on display at the public conslutation events and the answers they were given to questions they asked, repeatedly saying that they could not give an informed opinion about community impacts on the basis of the partial information presented. Who, and what is the development of York Central for? Specifically, how will the development contribute to the City’s aims to achieve greater fairness, reduce inequality and transform York for a sustainable future? What are the projected traffic levels and how much will this increase traffic congestion and air pollution? Why have access options other than Southern, Western 1 and Western 2 been ruled out? On Wednesday 2nd August at 6pm City Screen York has kindly agreed to screen Citizen Jane: Battle For The City. York Central Action have partnered with My Castle Gateway and there will be a panel discussion after the film to provide an opportunity to debate possible lessons for planning in York with reference to The Local Plan, Castle Gateway and York Central. Arguably no one did more to shape understanding of the modern American city than Jane Jacobs, the visionary activist and author of “The Death and Life of Great American Cities” who fought to preserve urban communities in the face of destructive development projects. Here, she fights against the ruthless redevelopment projects of urban planner Robert Moses. 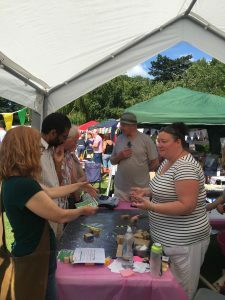 Many more people signed up for York Central Action when we held a great pop-up event in West Bank Park on Sunday 9th July. We had large aerial photos of the York Central Site and many useful discussions around the opportunities and worries of the development. So many people are worried about health and well-being, especially with increased traffic flow and air pollution. City of York Council is planning TWO consultations this year. The first is in August and focused on ACCESS OPTIONS. Watch out for this! The second one in the autumn will be around the Masterplan for York Central. 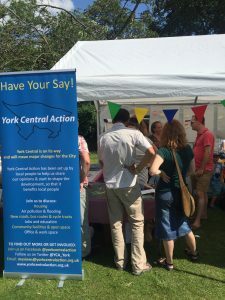 If you want to be on our mailing list write to info@yorkcentralaction.co.uk and we will keep you informed. We had a great pop-up on Saturday 22nd April in Cinder Lane. Many people from Leeman Road area. Most had heard about York Central but knew nothing about it. General view was that we need affordable /social housing and NO MORE offices. 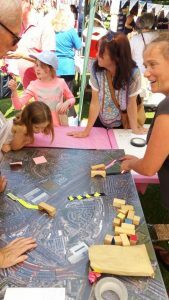 Lots of people were pleased that local groups have come together to give the community a voice but quite a few were cynical saying that the real decisions would be made in secret by the property developers and banks. We argued that collectively we have a voice and that there is everything to play for. Many are pleased about the Community Conference and said they would come or submit ideas on the website. I was left feeling that we must coordinate all we know and try to get a sense of what is not being told. The Community Conference on 29th April went well with some 55-60 participants. There were members of the public, people from community groups and politicians. 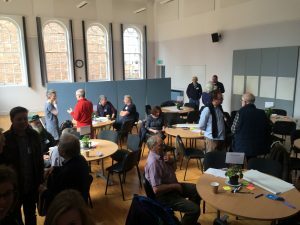 The Open Space format worked well with everyone sitting at tables discussing what they were interested in, rather than what someone else thought they should be discussing. During the conference two new groups formed, one focusing on Heritage issues and the other on Health & Wellbeing. We are preparing a full conference report but in the meantime there is a summary below of the key points that emerged as well as the planned next steps. Do you want to contribute to one of these teams? If you are interested in having a say please contact james.pitt@yorkcentralaction.org.uk saying which one. The idea behind a Task and Finish group is that it has a quick job to do, it does it, and it packs up! 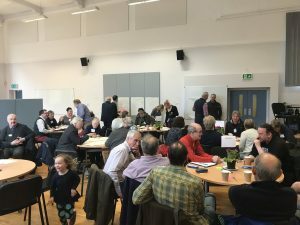 The Conference focused on six topics that were identified as priorities through the YCA Pop-Up consultation events held around York Central site in April. It included two sets of discussion groups on the key topics which included; Housing, Transport, Environment (air pollution & flooding), Jobs & Workspace, Education & Training and Public Land & other ideas.Delegates on the day also requested two additional discussion groups on Heritage & Health, which were then added to the final session. High concern issues of health, heritage, environment & transport are not being sufficiently addressed – worry that the Council plan is to bolt them on as afterthoughts which could be devastating to our city. These issues must underpin the development work. It is vital that the Council addresses these issues now, before any further design work is carried out. Unanimous agreement that Holgate Road is a completely inappropriate location for a new access road – due to traffic congestion, pollution, loss of green space & impact on the local neighbourhood. Often presented as cheapest option, but due to congestion even value for money is queried. Would like to see the Council withdraw this option. Environment –strong concern there has been a lack of transparency & information about the environmental impact of York Central available to the community to date. Critical that the Council & other bodies openly share information about the impact of flooding, air pollution & contamination & ensure this information is clearly presented in all future consultation materials. Housing – must not just be seen as an investment vehicle – but about creating new homes & communities. Council must represent the interests of the community in negotiations with partners & developers, with focus on creating a sustainable, mixed community that includes families, older people and people with different incomes. As the UK’s first Human Rights City we need to make sure we are not pushing poorer people out of the city & York Central. Targets & scale –Aim should be to create a sustainable development of an appropriate scale – not about achieving a huge city-wide housing target on one site at any cost to the city & surrounding neighbourhoods. Health & wellbeing – Very high level of concern about impact of this development on the health & wellbeing of the existing community & future generations. Urgent need for more information and a clear plan setting out agreed limits, mitigation strategies & prevention measures. Jobs & growth –concern that focus on high end office space will not create jobs for local people. Must consider what training, upskilling and apprenticeships are needed now to make sure York people are ready to take on new opportunities. Need to ensure – possibly through quotas – that there is also space for local start-up and independent businesses. Procurement – Local firms & workers must benefit from the development – developer & public contracts must ensure high number of good quality local jobs and training opportunities are created. Heritage – heritage is absolutely vital to our city and economy. If heritage issues are not properly thought through there is a risk that the scale of this development could over-power the historical core & the experience of the city, and this could undermine our key industry. Full attention needs to be paid to the heritage on the site and the impact of any development on the wider York Area. Concern there has been insufficient heritage input. This is far too important to be an after-thought – need to use all the expertise in the city to ensure York Central is sensitive to and where possible enhances the existing city. The first person I met at our pop-up at the Fox Inn no Holgate Road was none other than our MP for York Central Rachael Maskell! I didn’t need to tell her about the Community Conference as she is already coming to it despite the impending election. Then I got caught by a guy who is working in York on a temporary contract but who said how important it is to winkle out the hidden information and identify the vested interests. Some people are going to make a LOT of money out of York Central. Hmmm. I reckon if all the 25 or more community groups that make up the membership of York Central Action pool our information we will have a good idea of some the currents swirling beneath the water. Chris Barrett (Friends of Holgate Community Garden) and I went round the pub’s four rooms – actually it was mainly Chris. People were happy to talk to us and there was a lot of interest in the community Conference. The man from the Bowling Club took posters to put up in the club house. Key issues – will there be affordable or social housing? No more offices please! Where IS the access road going to be? Is the council keeping too much in formation to itself? We’d like to say a massive thank you to everyone for making us feel so welcome and for all the really thoughtful discussion and comments. We will make sure that the comments are captured in our work.